Now that we’re so late in the season, teams in the same division have almost all played each other once this year. Previous divisional matchups are a fantastic way to find how NFL teams may game plan for each other and which players will likely have success, since it’s the only time we have physical evidence when evaluating fantasy in the NFL. This week, there are so many divisional games that I have to break up this article into 2 parts. Summary: Derek Anderson was named the starter this week with Cam Newton’s unfortunate car crash keeping him sidelined for at least a game or two. Luckily for us, Derek Anderson actually started Carolina’s week 1 game at Tampa Bay this year, so we have a good idea of what he might do. He played quite well in this game. Tampa Bay was essentially shut out save for a few garbage time TDs. Derek Anderson – Was an efficient 24/34 for 230 and 2 TDs. It’s not far-fetched to think he can do the same (or better) this time at home. He’s min-salary on all sites. Kelvin Benjamin – I’m particularly encouraged with Benjamin’s performance playing with Anderson in week 1. Benjamin is usually a high target, low catch type of WR since he’s targeted so much deep. But Anderson connected with Benjamin 6 times for 92 yards and a TD, on only 8 targets. Newton has been pretty inaccurate this season, so I think Benjamin may actually benefit from this QB change. Greg Olsen – Olsen was the most targeted Panther with 11 targets, and had a nice 8/83 and a TD line. Panther’s run game – Had reasonable success with DeAngelo Williams leading the way. Mike Evans – Only caught 5 for 37 yards, but was targeted 10 times. Summary: This game had wildly different personnel than we expect this upcoming week. Austin Davis was the Rams starter, and Carson Palmer was still healthy. Andre Ellington also played. I’m not reading too much into this one. The only thing of note is that Larry Fitzgerald had a very good game, catching 9 balls for 112 yards on 10 targets. Summary: This was the Thursday night game where the Redskins came in as big favorites, then Kirk Cousins threw 4 interceptions and Larry Donnell scored 3 TDs. Odell Beckham Jr. had not come back from injury until a couple games later. Larry Donnell – He had 7 catches and 3 TDs, just wrecking the Redskins D. Even with the emergence of Odell Beckham Jr., Donnell seems like a solid cash game play this week. Giants WRs – Both Rueben Randle and Victor Cruz had solid games, combining for almost 200 yards. I expect Odell Beckham to destroy the Redskins secondary. Eli Manning – Had 300 yards and 4 TDs. I expect Manning to have success again this week. Giants run game – Rashad Jennings and Andre Williams combined for 4.3 yards a carry and had some success. I particularly remember Andre Williams looking impressive in this game, but Tom Coughlin has stated the Jennings will likely have a full(er) workload this week. Summary: The Colts seemed like they were going to run away with this one, jumping out to a 24-0 lead in the 1st quarter. But the Texans made it competitive, helped by some strong running by Arian Foster. Colts held on to win 33-28. 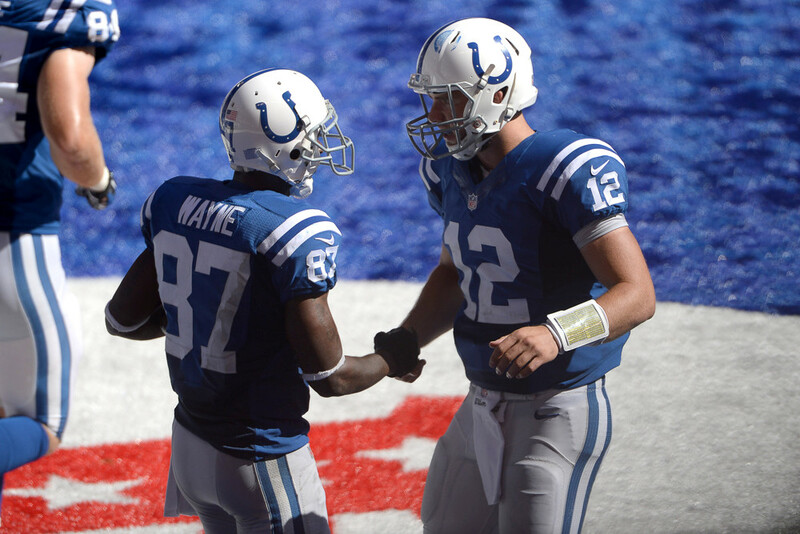 Andrew Luck – Had an Andrew Luck type of game with 370 yards and 3 TDs, mostly by throwing to his #1 option T.Y. Hilton. T.Y. Hilton – Hilton caught all 9 targets for 223 yards and a TD. Houston has consistently been burned by #1 receivers all season, it seems likely that Hilton comes away with another great game in this upcoming game. Arian Foster – This was the 1st game all season up to this point that anyone had success running on the Colts, but we’ve seen when the Colts faced the Patriots that you can run on Indy. Sadly, this time the Colts are at home and I wonder if Foster will have as much success. He’s a solid GPP play. Game Summary: Just an awful game to watch, the Bengals came in as a huge favorite but Andy Dalton threw 3 picks and only completed 10/33 passes. The Browns didn’t even have Andrew Hawkins in this game and this was before Josh Gordon was back. They ran 52 times total and each RB scored a TD, but collectively they only managed 3.5 YPC. Browns RBs: Terrence West actually led the way in this game with 26 carries. None of the RBs were spectacular and there’s no way the Browns will be running 52 times this weekend. That being said, with Johnny Manziel at the helm and Josh Gordon back I expect the Browns run game to have more success on a run by run basis this time around. The Bengals are bad against the run, but who to choose? I’m still going with Crowell. A.J. Green – Caught only 3 balls out of his 10 targets. I looked at previous box scores of this matchup, going back a few years. Green just doesn’t seem to do well against Joe Haden. I’m fading him.